Little Queen Vania is One of My Favorite Rage Bahamut Figures! There are a bunch of Rage Bahamut figures but, Little Queen Vania is one of my favorite. Between the figure, the base, and all of the little details Vania stands out as a great figure. She is made by Kotobukiya and is 1/8 scale. I love the bright and vibrant colors on her. The eyes are extremely well done! I love how clean and crisp the figure is. Everything looks well crafted too. 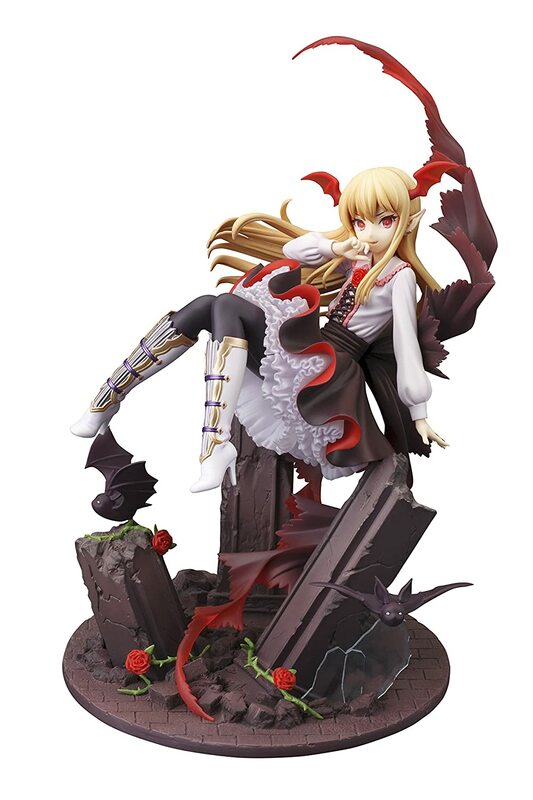 This figure preserves the anime quality Little Queen Vania has. What do you get with this Rage Bahamut Figure? Her skirt is so well done because of how much detail is in it. She has a little bow that goes on her skirt and it sort of wraps around the whole figure. It looks great because it really brings the piece together. Rage Bahamut Little Queen Vania has a wonderful Base! I love the base with the broken column, the roses, and brick work. I hope other figures make bases like this because it is something I really look at in figures. You do need to snap the columns into the base, therefore, there is some minor assembly. I love the addition of her bats! You can easily pop them into the base too. A very well painted figure! I really like the paint work on the face since it is so top notch. Although sometimes the face can be tough to get right on a figure, Kotobukiya nailed it on this one. Insane quality on the paint job. It pops out even from far away. Some figures have a weird facial expression but, not this one! I love how everything about this figure comes together so well and because of that, it looks awesome. A very high-quality figure indeed. I don’t have any complaints about Little Queen Vania, she’s awesome. Where did you find the Rage Bahamut Figures? I came across Little Queen Vania while looking for other Rage of Bahamut figures. I had seen one somewhere and noticed that they were all rather high-quality characters. She is my favorite out of the figures from this game. Check out Dark Angel Olivia and Dark Dragoon Forte!